The formation of stars in distant galaxies is still largely unexplored. For the first time, astronomers at the University of Geneva have now been able to closely observe a star system six billion light-years away. In doing so, they are confirming earlier simulations made by the University of Zurich. One special effect is made possible by the multiple reflections of images that run through the cosmos like a snake. Today, astronomers have a pretty accurate idea of how stars were formed in the recent cosmic past. But do these laws also apply to older galaxies? For around a decade, the Hubble telescope has been allowing astronomers to observe solar systems that are six or seven billion light years away. Hubble suggests that there are existing galaxies of nebulae and star clusters with a diameter of over 3000 light-years. These huge accumulations (“clumps”) of stars and gas – around a thousand times larger than the Milky Way, which is relatively new in the terms of the history of the universe – seem to be the norm for older galaxies. It is very difficult to investigate these phenomena in detail over such long distances. A team from the Observatory at the University of Geneva and the Center for Theoretical Astrophysics and Cosmology at the University of Zurich are now making use of one special effect of the universe that follows its own laws: The telescope is directed at a very massive object whose gravitational field influences the light of a faraway galaxy lying behind it. When viewed through this ‘gravitational lens’, the propagation direction of the light of the object behind it is altered. This enlarges the image and multiplies it several times. By these means, the researchers were able to perceive distorted, elongated images that almost touched and that looked like a ‘cosmic snake’. “The image enlarged by the lens is much more accurate and brighter. We can detect galactic details that are a hundred times smaller and compare five different resolutions to determine the structure and size of these gigantic clusters”, says Daniel Schaerer, professor at the Observatory of the University of Geneva. The international research group discovered that the clumps of stars were not quite as large and massive as the first Hubble images had suggested. With this, they corroborated Valentina Tamburello’s earlier simulations made on a supercomputer at the University of Zurich’s Institute of Computational Science. 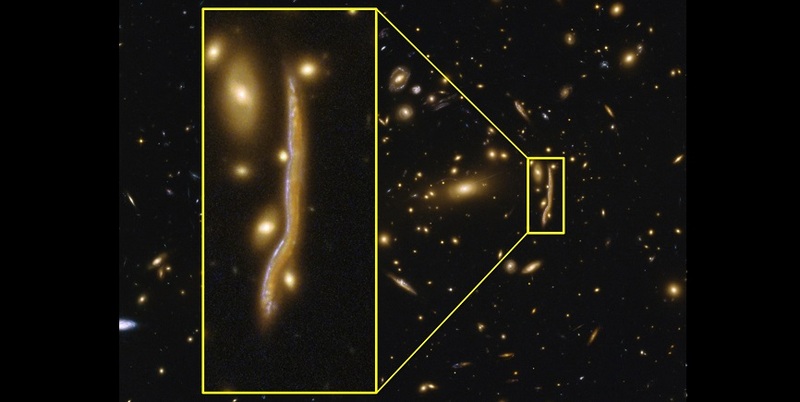 “Thanks to the incredibly high resolution of the cosmic snake, we were able to compare our calculations with the observations that had already been made. This was a huge stroke of luck for us”, explains the last author of the study. The conclusion: Contrary to what had previously been assumed, the galaxy studied is not composed of one large clump of stars, but of a number of smaller ones. “Obviously, gigantic clumps in such distant galaxies can only develop under very special conditions, for instance through smaller fusions or under the influence of cold gas,” Ms. Tamburello says. The fact that this was not the case had previously been impossible to detect due to the great distance involved. In her doctoral thesis, Ms. Tamburello had already concluded at the end of 2016 that the actual mass and size of the clumps could only be detected at a higher resolution.